I like when things work together. In four separate conversations, all with people who don’t know each other, I’ve been able to talk a lot about introversion in the past couple of weeks. We are definitely a family of introverts and I’ve come to realize that it can be HARD to be friendly with us if you’re not a fellow introvert! This week on the Unschool RULES Facebook page, I shared some links to cool stuff I’ve read that helps explain why we are how we are; I’m going to round those up here today, but also share a little of our story and why this is such an important topic to us. We’re just different – and it might be hard to understand that none of us likes to be interrupted, that we don’t really like people in our personal space unless WE initiate the contact, that we like quiet, that we don’t always want to “hang out,” and so on. She was actually talking about a broader description – and one that is a common misconception, in which people misunderstand introversion as shyness or privacy. Certainly there are shy introverts. I’m not one of them. I’m a gregarious introvert. I am outgoing, and comfortable speaking in front of large groups of people, and, well, kind of loud. But being an introvert, in its simplest form, doesn’t mean you hate being in crowds. At the most basic level, being an introvert means you recharge alone. Here’s a good read from Wikipedia on extraversion, ambiversion and introversion. If you’re an extrovert, public speaking or a good party rev you up. You seek out other people, and if you’re left alone, you feel restless. It’s more draining for you to be alone than in a group. As in introvert, I’m the opposite. In my case, I can speak in public – and in fact, I even enjoy it – but it’s draining. When I’m done, I need to get away from the crowd. It’s like my battery has died. When I’m in a crowd for too long, I get physically tired and almost claustrophobic. I need to be alone for a while. Yet I’m a not a loner. I just prefer being in small groups of people I’m close to, and I prefer to make any interactions ones of my own choosing. In the Myers-Briggs inventory, I am most often an INTJ (introverted – intuitive – thinking – judging) or an INTP (introverted – intuitive – thinking – perceiving). At some times in my life, especially recently, I’ve veered more toward ISTP (introverted – sensing – thinking – perceiving). There are a total of sixteen personality types: eight introverted, and eight extroverted. Here’s a pretty good test for finding out what your “type” might be. … And here’s a great site that will tell you more about your strengths and weaknesses based on that type! When you realize that there are eight distinct types of personalities that have the introversion trait, you start to realize that introverts “in the wild,” as it were, can look really different! Ah, herein the difficulties start. BEING introverted sometimes looks different. We often don’t like interruptions. We don’t like physical contact unless WE initiate it. We sometimes like to observe what’s going on from a safe distance (sometimes for quite a while) before getting involved. We get attached to things that may seem unusual – games, fictional characters, inanimate objects. We go to parties, but arrive late and leave early. When more than one of us is in a room, we can sit quietly and be incredibly happy. We get pulled in to things we’re interested in and have trouble switching gears. 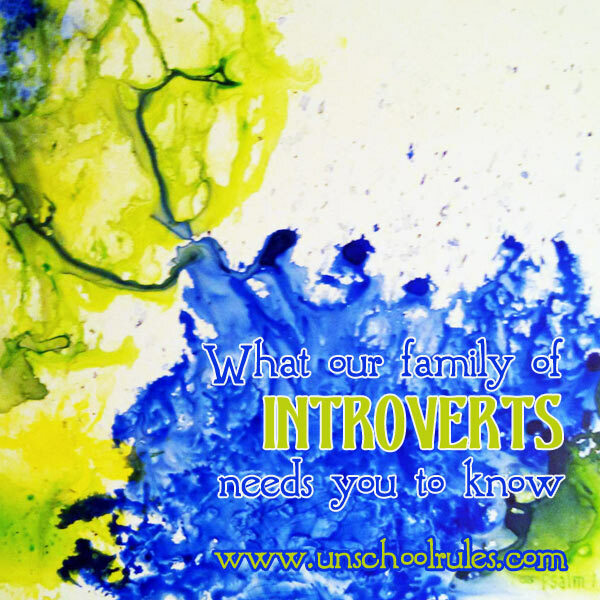 We actually have it easy in our family, in a way: Chris, Sarah and I are all introverts. We’re very different, but we go along well together because, without even trying, we’re used to giving each other space. Funny introvert story: One time, the three of us took a two-and-a-half-hour car trip. We probably said about 5 sentences between us the whole time. When we arrived, Sarah got out of the car and said, “That was a really nice ride!” We are just comfortable in our own heads together. As I said, I think we have it easy. I told a friend last night that I think the hardest thing to do would be to meet the needs of a child who was very different from me – to parent an extrovert as an introvert, or, if I WERE an extrovert, to parent an introvert. I can’t imagine how hard that must be, and my heart goes out to those of you walking that out! An update: About a day after I originally posted this, I found an amazing hand-drawn guide called How to Live With Introverts. I can’t even say enough good things about it. It’s even printable – so you can make copies for all your friends! I’ve been sharing a lot about what introversion is and looks like, but I haven’t talked much yet about how it relates to our unschooling lifestyle. There’s an amazing post on Living Joyfully (Pam Laricchia’s amazing unschooling blog) about video games and TV, yet another topic I’m passionate to defend in our family. Its mention of introversion is brief, but throughout, you’ll see why this plays out as such an important way for our family to be – a way that we can be social while being antisocial, as some people might see it, but in which we can all recharge, process and, yes, learn! Let me be very clear that these things overlap, but they’re not requirements of each other. Lots of introverted people are “neurotypical,” and lots of people with autism and Asperger’s are NOT introverted. But when they do intersect, things are more pronounced. My introversion, or Chris’s, is “socially modulated.” We might hate small talk and certain social settings, but we have ways of getting through it that maybe mask our discomfort a bit. Sarah’s ways of getting through such events sometimes draw attention to her discomfort, rather than hiding it. That’s NOT a bad thing – but it means that sometimes, I wish I had a better way of explaining to people that they can help, simply by not making assumptions that’s she being “difficult” by not participating in the way they think she should, or by watching instead of joining. And, I hope you knew this was coming – ALL the tips in this article are great for dealing with introverts NOT on the autism spectrum as well! We have good friends living with us for a little while – a family of three extroverts. One of the conversations that started this series came because, well, surprise: We’re a little hard to live with. The nice thing, I told our friends, is that while we might be quiet ourselves, if we’re busy doing something, we’re all the type not to NOTICE if they’re happily being louder than we are! Then there’s our propensity toward hyperfocus. Ask us a question when we’re busy, and it might seem like we’re ignoring you. We’re not – at least not consciously. I’ve been known to tell my mom “Yes” to things like “Do you want an egg?” and then be surprised when an egg appears in front of me, all because I was writing when she asked and I had no idea what I was even responding to. Sarah has been known to look around at midnight and say, “Where’s Mommom?” when she said goodnight to her at 9 p.m., while she was gaming. This translates in another way, too. I told my friend Dana, “If I’m writing and you bleed to death on the floor behind me, I may not notice, or I may be a little annoyed if you can’t do it quietly.” You can imagine I’m a party to live with, can’t you?! (And, yes, I WOULD help her if she was bleeding to death on the floor behind me. Honest. I promise, Dana.) It’s not that I don’t care or am unobservant. Oh, and hugging. I don’t hate hugs. But I admit, I am a hug control-freak. No surprises, please. I need to know it’s coming. Hugs from Sarah and Chris? Yes, because they’re almost an ask-permission event, one that we’re all comfortable with. Giving hugs? Not a problem – it’s on my terms. Surprise hug from behind? So, yeah… I can imagine we’re a real party to share a house with! If we know you’re not of the mind to do that, we’ll psych ourselves up for something awesome – bowling, a board-game night, a luau – and have a good time with you on “extrovert terms!” We might not be the first to arrive and the last to leave, we might kind of stand on the sidelines a bit, and we might not introduce ourselves to a ton of people. But just because our fun looks different doesn’t mean we’re not having fun! We kind of like it – it’s fun to get out of our heads for a little. Just love us enough to let us back in to recharge! We don’t look at extroversion OR introversion as “right” or “wrong.” The good part about people is that they’re all different… and it’s cool to think that we’re living proof that even when it’s not easy, you can house two VERY different families under one roof and still be friends! So are you an introvert or an extrovert? What about your family members? Any questions, challenges or tips to share from your perspective? This entry is about asperger's, family, philosophy, sensory stuff, unschooling. The previous post was 10 unexpected benefits to learning together from life. The next post is A birthday celebration: Learning about Annie Oakley, a wonderful woman of the Wild West. Well,I certainly feel better knowing that if I’m bleeding to death you will in fact help me. And I also agree you guys are really good friends to have and we certainly count you among our closest and favorites…. weirdness and all. Living with you guys is probably more of a blessing that we expected, because we get to Learn about a whole new sources of people up close and personal. Like a safari! We love you 🙂 Also, PLEASE KEEP YOUR HANDS AND ARMS INSIDE THE BUS… THE OTTOPOTAMUS SOMETIMES BITE! And maybe one of these days I will learn to read what I write before I post it… so I can fix all that auto correct awesomeness. Phyllis, I think that’s the most interesting thing. I have some other friends who are very introverted, but they don’t seem to “know” it … or at least, they don’t seem to accept it; they keep trying to change, and I firmly believe that while you can socially modulate EITHER personality type, you can’t just wish yourself different! I am so glad you’re also a fan of saying what you mean. That is a trait I REALLY respect!! I’m a total introvert … but the leader of my homeschool group. I used to be very shy but learned to overcome shyness (but not, of course, introversion!) My husband is an ambivert who uses up all his extroversion at work and is a functional introvert at home. My 3 oldest kids are all introverts to varying degrees. And then there is their younger sister, my baby girl, the extroverted cuckoo in our introverted nest. I can attest that you are correct in thinking it is difficult to parent the opposite type, especially when we are totally at different ends of the spectrum! When, as a preschooler, she would start chatting up the sales clerk as we were checking out, I would watch like a hawk to see if the clerk was charmed … or wondering why I wasn’t controlling my rude kid! I’ve always tried to support her personality rather than quash it but it is hard not understanding what goes on inside her head. I think the greatest thing (and the skill that Chris, Sarah and I have not yet mastered) is that you guys have built-in practice working together and loving each other. I would previously have said that in many ways, Sarah and Chris are MORE introverted than I am, but really I think it’s that they are more reserved than I am. (That’s NOT a trait I really have!) I think I am the same way – I “use up” my extrovert, or my social modulation, during working meetings and then my family gets the introvertiest part of me. The thing that makes me sad sometimes is that society seems to value extroversion. When Sarah goes to events, she can be having a BLAST, but because she’s not as exuberant as some of the other kids, she’s constantly questioned, “Aren’t you having fun? Why aren’t you doing XYZ?” As an adult, I get that a little bit, but I think people are more accepting of quiet adults than quiet kids. Because we’d rather be the ones being uncomfortable than someone else. The thought of someone being even slightly put out by something I’ve said or done utterly mortifies me, to the point where I’ll lie to make sure they’re comfortable. For example, I went to the dentist today. She had a horribly bright light that she couldn’t keep out of my eyes. So rather than request she move the light (thereby making her lose her train of thought, or disrupting what she was doing), I laid there in extreme agony just to keep her in her own “comfort” zone, even though it probably wouldn’t have been a big deal to her to move the light. I guess those of us like this (or maybe I’m the only one!) have skewed views of what other people are thinking. I’m not sure that’s specifically an introverted trait, though. Thanks for these great links! I love reading about introverts. Our families are similar except I have an extrovert thrown in. That is a really interesting perspective, Jerzy! I think I do some of the same – I don’t “complain” about certain things to avoid offending people – but at the same time, if I do say something, I really mean it. I’m sort of the example of not saying anything at all, or really saying what I mean, but not much middle ground. I love the article. My self I am an INFP. I find parenting really pushes your comfort level. I remember the first time I had a child have a full blown tantrum in public…I just wanted to hide. Thankful that we all can grow and learn and “practice” new skills. Frostie, thanks for stopping by (and I love your nickname!) You are so right. Parenting really pushes you out, doesn’t it?! In so many ways! Thanks for stopping by, and for being willing to practice along with me. That’s exactly what it is! I’m an INTP! Very rare for females. And yes to ALL THE THINGS. I’m also an auditory learner, so I need to recharge ALONE and in SILENCE. That is hard with 3 kids and a husband who likes to play background TV or music at all times. The funny thing he is even more of an introvert than me but noise doesn’t bother him. I love talking and being around people. It just exhausts me. I like the internet because I can get my discussion on and when I’m done I can walk away. LOL But I am/was a leader in my church and homeschool group and I organized things all the time. It has taken me a lot of years to get to that point though – to be able to call someone on the phone to ask them a question or to approach people to invite them to an event. Part of my growth was being blessed by an extrovert daughter. Raven is so extrovert, her dream job at age 4 was becoming a Walmart greeter so she could “meet all the people and make them my friends”. She has been the driving force behind a lot of our social life. And then we have Denna, who’s nickname is “Motor-mouth Mabel” but is very introverted like me. We don’t know about Gus yet – too soon to tell. That is SUCH a key point about the internet. I think that’s why Sarah enjoys gaming so much. She’s together with friends but in her bubble, you know? The other thing I find is that there’s no need for small talk or transitions – I don’t have to lead up to a question I want to ask my friends online with a bunch of “Hi, how are you, how’s the weather, blah blah,” I can simply pop into a group and say, “Hey! I need a link to a personality test” and BOOM!! Raven used to FREAK me out when we would go shopping. She could strike up a conversation with anyone from age 2 on. I would be swooping through aisles trying to grab what we needed so we could get out without touching anyone and I would turn around and see her chatting up a random stranger! The horror! But, it’s been kind of nice. She meets the neighbors and introduces herself and that gives the rest of us introverted homebodies a way in to becoming friends with people in the community. Extroverts have their own superpowers! I have so many extrovert friends I’d love to hang out with on that basis but no way can I sign up for more than one extroverted evening a week (make that a month). I love that thanks to books like “Quiet” and blog posts like yours, introverts are coming out of the closet (to ourselves, apart from anything else. It took me until I was 40 to realise that just because I’m loud and unreserved didn’t mean I wasn’t an introvert). We still have a way to go though until introverted socialising preferences are fully acceptable. I’m an INFP/INFJ with an ambivert husband, one introverted son and an extroverted daughter who spends a lot of time on Facebook and Skype! Thanks again for a fantastic post. Lucinda, I can’t tell you how much you made my day!! I, too, am so glad that we’re all starting to be able to better recognize what’s healthy and necessary for us – it’s helped me more than I can say and I’m glad you’ve found the same. You rock. Thank you for sharing your story! Well, Joan, I think we were meant to be twins. I can totally relate to this post. One thing I never realized was that introversion is the reason I don’t enjoy random physical contact–lightbulb moment for me! I am a very strong introvert, and hate that people tend to think that means I am shy. While I was shy/quiet as a child and teen, I have no problem as an adult initiating conversations with complete strangers, although I’m not likely to share a lot of personal thoughts or feelings. I am so with you! This is not a “problem” to overcome. It is what makes us who we are, and I love it! I also realized as I read your comment that, like you, I am not likely to share a lot of personal thoughts or feelings. It’s funny, because I share a lot about our life through blogging, but it’s factual. “This is our total debt.” “This is what happened when Sarah struggled in public school.” Very rarely can I let go enough to talk about how these things make me feel. Great post, Joan. As an INFP raising an EXTREMELY extroverted child, I am constantly struggling. For example, my mind is constantly working but I don’t typically express my thoughts verbally. With Afton, EVERYTHING she thinks comes out of her mouth. She also has no concept of personal space. She hugs everybody. I won’t even come close to making physical contact without a clear invitation. So for me, it’s a constant struggle to keep myself from imposing my own introverted sense of “normal” onto her while still teaching her that there are some things that are inappropriate to do or say regardless of your introversion or extroversion. Doug, I honestly don’t know how you do that. It would make me tired ALL THE TIME. I also think the fact that you’re trying hard not to impose your own value judgment on your daughter is great, but again, that’s literally daily work. This is a really great post, and really great insight into my own personality. I am an introvert, plain and simple. I have very very close friends and very few just friends. My friends tend to be very close, and I share personal information with only those people. If they go out and betray my trust- they are done. Finished and over. Don’t want anything to do with them. Unfortnantely, I don’t have a high tolerance for stuff. I don’t do well in mixers. It’s very uncomfortable for me to initiate conversation. Impossible almost. I might sort of work my way into a conversation but not say anything much. I would rather be at home. If I’m walking into a party late, I don’t feel the need to introduce myself to everybody (what’s the point anyway, I’m not going to remember their names). Would rather come in invisible and find my one person I enjoy talking to. I am NOT a hugger. I really had to work hard to get over that. I just don’t like people in my space. But for some reason, people on the east coast seem to need validation and hug all the time. It’s definitely not part of “my” culture growing up. It was so very hard for me to hug them, but over the years, I have gotten used to it. I never initiate it though. I am happy saying see ya, bye-bye – and walking out the door. A wonderful post. It is more comfortable for me to be recharged alone most of the time. Hanging out with suitable person is a great pleasure for me. I try to go with various persons anyway. I’ve been reading a number if your posts today. And other days too but today I’ve been rereading and reading them.to my husband and discussing with him. We are introverted (my husband less than me) and all three of our boys are introverts as well. It is strange how quiet my house normally is for have 3 boys 🙂 We have a natural flow to our days which allows each of us to have some independent play time. Except me. Because i have a 9 month old and any time I get him laid down I have a 3 year old climb into my lap. As much as I enjoy my children, I am looking forward to the more independent days in the future! Tessa, I hear that so much! I can tell you from experience that you’ll get your uninterrupted time later, but I know how hard it is when they’re that little – and I only had one! I felt like I was hiding in the shower sometimes to have a minute to just breathe! And I love my daughter, too! 🙂 Thank you for reading and commenting! I really like this page. I am an introvert and I think everyone in my family is also. We can all be in the same room but do our own thing. I am a teenage girl and have recently been researching introverts and Briggs Myers personality theory. I like your page because it has alot of useful information and some funny stories. I have never heard of unschooling. Is it similar to home schooling. I’ve been home schooled in elementary but I am now attending high school. I like science, physochology, and philosophy. I like both home schooling and regular school they both have advantages and disadvantages. Hannah, that’s so cool that you are interested in Myers-Briggs! I bet most people you go to school with don’t know what it is. You’re absolutely right, too, that public school and homeschooling both have their pluses. I went to public high school because I was super-interested in math and there weren’t all the online options for learning higher math in 1999 that there are now! It was the right thing to do but I loved homeschooling too! How cool that you have a family of introverts, too. We are the same way and other people might think we’re weird but we are happy together! I know I’m late to the conversation, but I just wanted to stop by and say how much I enjoyed your post. We’re a family of introverts too. I’ve just written an introvert post and I was looking for some other unschool introvert links to share on my Facebook page. And that’s how I found you! I love your egg story. I’m always being pleasantly surprised by the arrival of coffee or a sandwich I don’t realise I’m asking for! I can relate to so much of what you’ve written. A lot of great information. Thank you! Hi, I am way late on this conversation, but just came across it and wanted to comment. I understand your preference of arriving late to a party and leaving early. Less time in a crowd = less energy expended. But for me, as a more shy introvert, I prefer arriving early and leaving late so I can greet/say goodbye to people one-on-one, one at a time, rather than saying hi or bye to a whole group (everyone looking at me at once). I’d rather become totally drained by staying a long time than having excess attention drawn to me! Sarah, that’s an interesting point! Thanks for commenting! I just found this blog and have been reading up a storm:) We homeschool our 4 but they are at the young end yet, our oldest is 8. Have to tell you my mind was just blown and now I need to go up and take the test to see where I fall. It never occurred to me that a person could be an outgoing introvert! I always assumed shyness was a part. As an RN and the oldest of 5 kids and now the mother of 4 I am constantly talking to people or meeting their needs. It is draining and I think I only really notice it now because when I am home or in the car I still have 4 people with me at least! Prior to our kids I would read or rehab our house or crochet and it was silent or with music that I could ignore. Ive realized in the past year or so that I have no recharge time and it just occured to me from this post that I really recharge best with some alone time (or alone time with my fictional book friends). Its why I am often waiting for everyone to be in bed before I shower or just take 20 minutes to not have someone need me. Amazed over here, thanks!!! I think I find my work self and my non work self very different. Even my work self with patients vs my work self with coworkers. Its not a matter of who I am but rather who I need to be at this moment. Hmmm? Joan, being in healthcare some and knowing you said you expend all your extrovertedness at work how do you score yourself for a myers briggs? Hey Stefani! I am so glad you found us and this post specifically! For Myers-Briggs I tend to fall between INTJ and INTP, though I will occasionally come up INFP or INFJ. I really complicate things because I also am bipolar and my responses can vary a bit depending on my mood status! Z, thanks for reaching out! The biggest advice I can give you is to remember that homeschooling doesn’t mean you have to do everything yourself. Scouting, 4-H, library programs, playgroups, park programs, gyms, co-ops… there are so many resources out there where your son can go and be with people – and that can allow you time for yourself while he’s doing those things! Some of those things cost money, but others are free or very low-cost. Your local newspaper and Facebook are great sources of activities and groups. Some do require parent involvement, but a lot don’t (or only require it on a rotating schedule).